Well I finished this year's words early and am delighted to again be a NaNoWriMo winner. While it is extremely satisfying to have 50,000 words on paper, the real sense of accomplishment comes from having a consistent writing practice. The energy of this month easily carries over for me. As I stick to the "just write, don't revise plan," it means I now have 50,000 words ready for revision. I am rich with possibilities. If you have been too intimidated to try NaNo becasue of the sheer volume of work, please reconsider for next year. What if you try and "just" get 20,000 words? Well, you still have 20,000 words, so you'd be a winner in my book. Truthfully, once you do it, 50,000 doesn't seem like so many words and once that daily practice kicks in, you'll be on a roll. 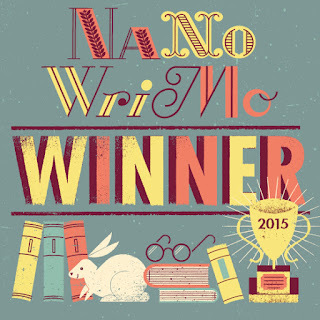 Congratulations to all the writers who participated this year and thanks to NaNoWriMo for being such a tremendous advocate and facilitator to writers everywhere.